You will receive an e-mail alert when the price of The Witcher 2: Assassins of Kings will drop. 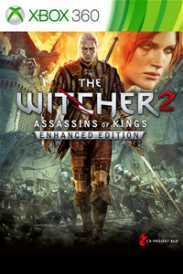 The Games on Demand version supports English.Download the manual for this game by locating the game on http://marketplace.xbox.com and selecting “See Game Manual".The Witcher 2: Assassins of Kings features a thoroughly engrossing, mature storyline that defines a new standard for realistic,non-linear game narration. In addition to an epic story, the game features a complex combat system that uniquely combines deep tactical elements with dynamic action.